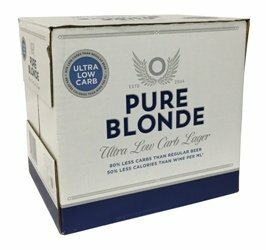 Pure Blonde - the first beer in Australia to be marketed as low-carbohydrate - is full-strength and great tasting, with 70% less carbohydrates than a regular beer. Now the fastest growing packaged regular beer brand in Australia, Pure Blonde is proving to be a big hit with beer lovers, with 94% of people who try Pure Blonde buying it again. Pure Blonde is a light, crisp, aromatic lager that delivers a superior taste. It has been specially brewed longer to produce a beer that is low in carbohydrates. Pure Blonde's advance brewing techniques and pure ingredients creates a satin smooth finish and it is immensely refreshing served ice cold. nice and cold this is a crisp refreshing beer. Slipped under my radar but it's now I've found it I've got to tell you how good it is. You won't be disapointed. cheers! Hi, I highly rate this beer and thus the price. Personally I lost 30kg by changing to this beer. keep it coming. Making London an okay place to be when outer of range and away from tap. No luck. No PB on tap in uk. We need to start a petition! I miss it so much!! A unique tasting great smooth beer! I am an Aussie recently moved to UK and am missing my Pure Blondes terribly. Glad to find it online. We also drank it constantly in Aussie and can't find it in UK. at reasonable price. Come on Tesco pull your fingers out!!!!! Drank this stuff constantly in Australia now trying to hunt it down in the UK!